All-star NYC real estate broker at Corcoran showcases his distinctive approach to success with a responsive video profile page. Designing real estate marketing tools for Corcoran. Meet Corcoran Group all-star Brian Meier, head of the #1 real estate team in transactions in Manhattan. As one of the most accomplished and recognized residential agents in NYC, web presence key to success. For several years, Brian Meier has trusted Digimix to lead key digital marketing initiatives, including the design and development of multiple websites, blogs and sales tools. As Meier transitioned to a leading a new team at Corcoran, he was looking to communicate his distinctive approach to leading client success in one of the worlds most intense real estate markets. 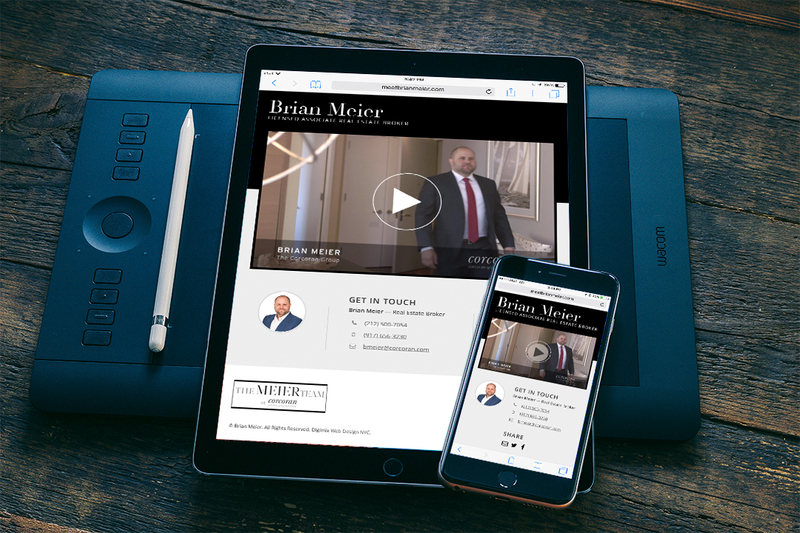 What if we transform your initial client conversation into a web-based video experience? As part of these efforts, Meier partnered with Digimix to launch a new MeetBrianMeier.com. We worked with the Corcoran team to design digital sales tool in the form of a video profile page for all-star real estate brokers. User Experience Design - We worked with the Corcoran team transform the initial client meeting experience into a video-based digital experience. Responsive Web Design - The fast loading touch-enabled video player makes this a go-to sales tool for agents on location.